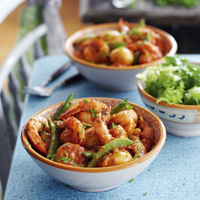 Tasty pink prawns are the stars in this Mediterranean-style speedy stew flavoured with aromatic fennel seeds and gently warming chilli. Spray a large saucepan with low calorie cooking spray and place over a medium heat. Add the garlic, onion, fennel seeds and chilli flakes and stir-fry for 1-2 minutes. Add the potatoes to the pan with the passata and bouquet garni and bring to the boil. Reduce the heat to medium and simmer gently for 10 minutes or until slightly reduced. Season well, add the prawns and sugar snap peas and cook for 5 minutes or until piping hot. Remove the bouquet garni, scatter over the parsley and ladle into warmed bowls. Serve with salad or vegetables of your choice.